Sparrows in an East Cumbrian town have found a unique way of finding food. 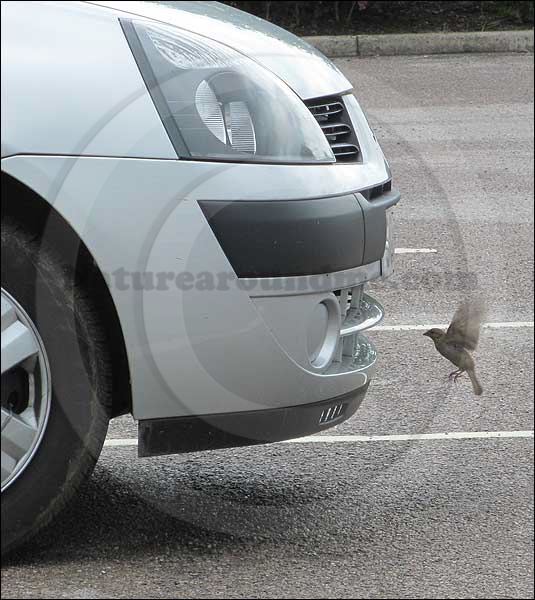 Cars arriving at the Co-Operative store in Kirkby Stephen are given a close inspection by the resident sparrows on the search for bugs. In a sort of drive through food outlet for birds, flies and other insects are removed by the birds whilst the car driver goes for the shopping. Around a dozen birds appear to patrol the car park on the look out for new cars arriving. After locating the front grill area of the vehicle they then inspect the grill and the wheel arches on the search for food. Picking off any bugs with their beaks. Often in groups of three or four, the sparrows seem to have realised that they can get an easy meal just by cruising the car park. Over the course of a week hundreds of cars arrive in the car park providing possibly thousands of ready meals for the local bird population. Many people often see sparrows in the garden eating scraps and seeds or eating from feeders. It would appear that these birds have adapted to take advantage of the regular arrival of cars and the various assortments of bugs stuck to the paintwork.